So I’m six months into this pregnancy. My little baby boy is kicking around and making sure I know he’s there – which is an incredible feeling! It is, though, making me more and more aware everyday of how much has to be done before his big arrival. In an effort to calm this anxiety what is a girl to do but pick up her crochet hook and make something for her baby to be? This project had to be quick and simple though as my checklist is long and there is no time to waste! So I made the simplest baby beanie for my sweet little guy in a fun cotton candy colored color way. I know this little hat brightened my day and I can’t wait to pop it on his little noggin! The hat I made is in a NEWBORN size – perfect for tiny little cuties. This beanie is so quick and easy – it will probably only take you 30 minutes to whip up! 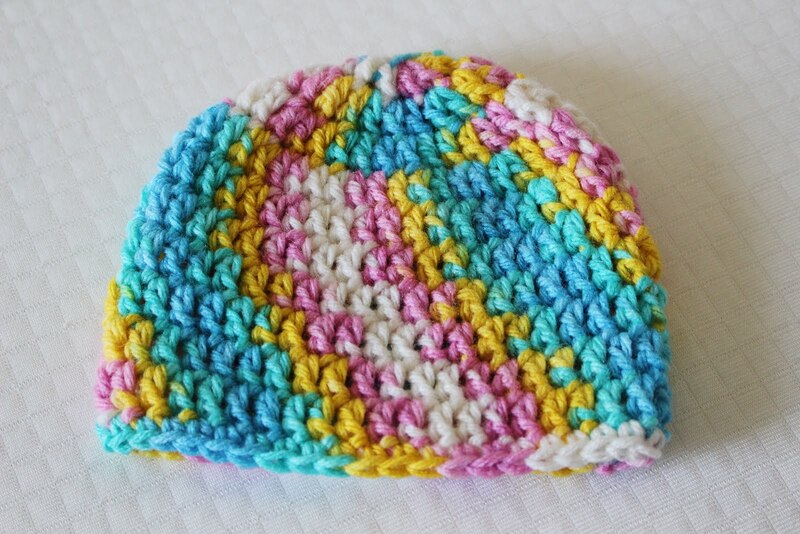 This is also a great pattern to use for quick donation beanies. Hospitals and NICUs are always in need of handmade donated items and these take very little time to whip up! I don’t see the free pattern. the reason being there wasn’t the # of stitches for each & every Row. If you could send me the correct amount of stitches that would be wonderful !!! Thank you for this simple pattern. Great for the charity work that I do.